When perusing the top 100 trainers in Betfair Hollywood Park history, family legacies quickly become apparent, but the best example of friendship and family are exemplified by the intertwining lives of trainers Tom Proctor, Mike Mitchell and Marty Jones. Tom Proctor, 57, whose father Willard ranks 61st on the all-time list with 173 victories, won the final running of the Sunset Handicap closing day of the summer meeting with Marketing Mix for Glen Hill Farm. The Proctor family has trained for Glen Hill Farm since 1967. Tom went to school in Texas and came to California to work for his dad between his junior and senior years in high school. He eventually became the groom for Convenience, another Glen Hill colorbearer, the year she captured the Grade I Vanity Handicap. While working for Willard, Tom because good friends with Mike Mitchell, who at the time was Willard's assistant. “Willard was like a dad to me,” recalled Mitchell. “In fact, all the Proctors are like family to me. Mitchell, 65, began the final Autumn meet with 902 victories in Inglewood, second only to Bobby Frankel's 952. Like Tom, Mitchell learned the ropes from his father. Trainer Earl Mitchell, however, left the business when his stable was dispersed and Mike went to work for Farrell Jones, eventually becoming Jones' assistant trainer. Mitchell became fast friends with Farrell's son, Gary. Mitchell briefly relocated to New York but longed to return to Los Angeles. “When I came back, I had no stalls and it was Willard Proctor who gave me a few of his at the end of his barn,” explained Mitchell. My first winner was at Bay Meadows with Break a Leg, but my first real winner in Southern California was a horse named Macadamia,'' he recalled. “It was quite an achievement because I claimed him from Bobby Frankel. Frankel had brought him here from New York and dropped him from $40,000 to $8,000. “After I claimed him, I won a bunch of races with him and every time he won, Bobby would get more and more mad. The funny thing was that I had been borrowing ice from Frankel and guess whose stall was right in front of the ice machine? Macadamia. Through his friendship with Gary Jones, Gary's son, Marty, became part of Mitchell's extended family. Marty has more than held his own in the Jones' training dynasty. Now in his 17th year on his own, he has crept up to 46th on the list of all time winning trainers at Betfair Hollywood Park with 216 victories, joining grandfather Farrell (11th/479 victories) and Gary (13th/463 victories) in the top 50. “Mike goes back so far with my family and he's always been very good to me,” said Marty Jones. Marty's first victory was at Betfair Hollywood Park with Made of Jade in 1996. Six weeks later he collected a Grade I win when Auriette won the Gamely Handicap with high school best friend Corey Black in the saddle. Marty also won the 2007 Grade I Triple Bend Handicap with Bilo, who remains in Jones' barn as a stable pony. Another testimony to Jones' loyalty is still-working groom Jose Castaneda, who started with Farrell six decades ago and tended to stakes winners Fali Time and Unzip Me for Gary and Marty, respectively. Tom Proctor, Mike Mitchell and Marty Jones are naturally sad that the Autumn meeting will be Hollywood Park's last, but each has a lifetime of memories of the Inglewood landmark. Here are several more top 100 parent/offspring trainers with their ranking and number of winners: Richard Mandella (6th, 603)/Gary Mandella, Mel Stute (8th, 575)/Gary Stute, Warren Stute (25th, 355)/Glen Stute, Ted West (63rd, 169)/Ted H. West, Wally Dollase (72nd, 152)/Craig Dollase, and Richard Mulhall (74th, 151)/Kristin Mulhall. 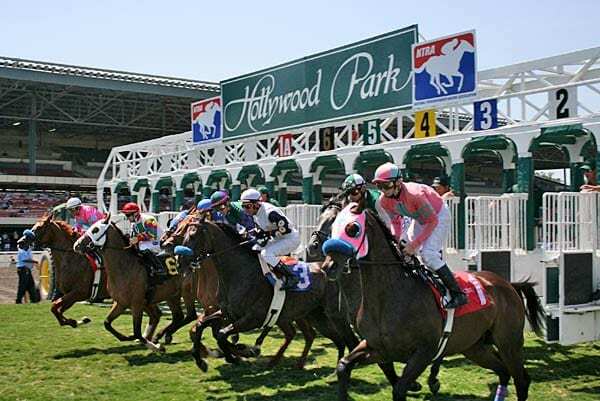 This entry was posted in People and tagged Betfair Hollywood Park, Gary Jones, Hollywood Park, Horse Racing, marty jones, mike mitchell, thoroughbred, Tom Proctor, willard proctor by Press Release. Bookmark the permalink.